There are two ways to get started, either by creating a new project inside the JobWalk app or by downloading an online HoloBuilder project you already set up using your browser. 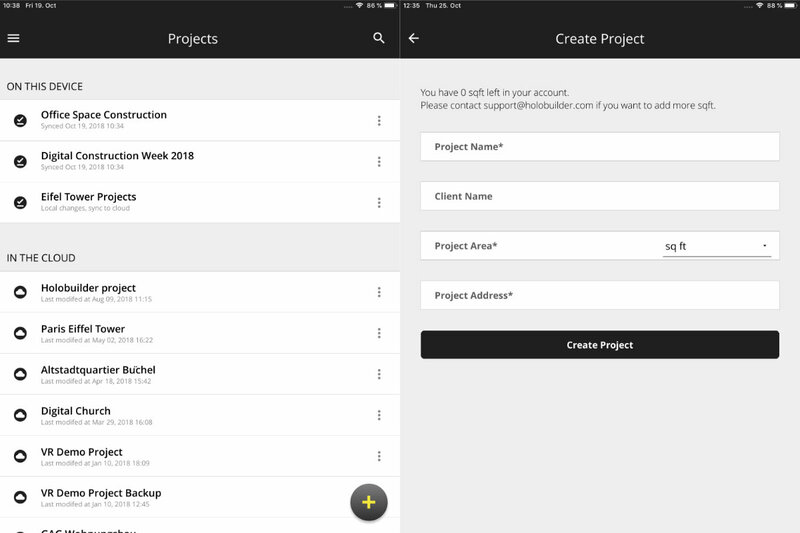 You can start creating a new project by selecting the yellow + button at the bottom-left of your list of projects, providing project details and tapping on ‘Create Project’. 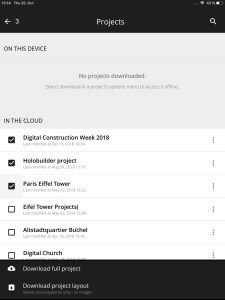 To download one of your online HoloBuilder projects from your cloud and using it with the JobWalk app simply select it from the ‘IN THE CLOUD’ section of the project list. To download one project select it and select ‘Download full project’. Your project will be downloaded. 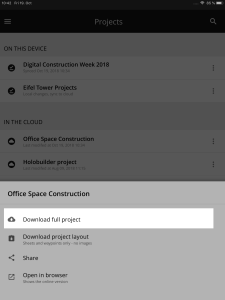 If you want to queue multiple projects to download you can tap on the cloud symbol of one of the projects you want to download, scroll down the list and select additional projects. If you’re done making your selection, tap on ‘Download full project’. ‘Download full project’ means that all the data of that project is stored locally on your mobile device and can be edited with the JobWalk app. A large number of projects or project with a lot of images can drastically reduce the free space you have on your device. This is where the ‘Download project layout’ and ‘Free up storage space’ functions come in. Layouts are all the components you need to walk your site, but nothing more. ‘Free up storage space’ turns your project into a layout. Once your have created or synced a project you can continue by uploading one or multiple sheets to your project and then you can start to take 360° photos and create a virtual tour.